In 1936, the difficult employment situation in Wheeling finally forced my father to look for work in other areas. After checking in various eastern cities from Baltimore northward, he was successful in New York City. There he had friends from the old days in the orphanage, who were able to put him in touch with people in the building program of the Brooklyn Diocesan Building Commission of the Roman Catholic Church. We took up residence in Kew Gardens, Queens. This migration spawned a whole new series of adventures, far too many for an Epilogue. I will present here only a few of them, just to give assurance that the painful process of growing up continued in the new location. 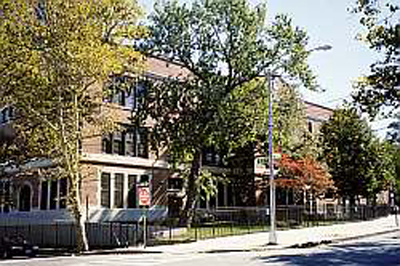 Much of this process took place at Public School 99, Kew Gardens, shown below as it was in the old days as well as more recently, in color. 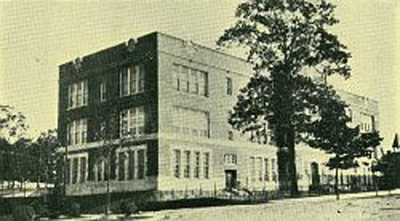 I entered this school in the fall of 1936, and graduated in January of 1940. 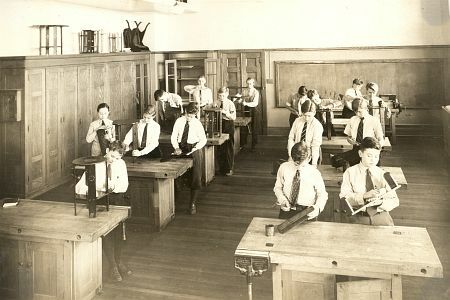 Here we see a picture of the woodshop class – an end-of-semester shot with everyone dressed up and nobody really working. I am shown at front right, holding a bookrack that I had made, and which is still extant in the family as of 2013. I frequently failed this course because of two major flaws. The other flaw was poor planning skills, as exemplified in the bookrack shown. Cutting the grooves to insert the upright ends, I forgot to allow for the thickness of the saw blade, and produced a groove with lots of room for wobble. The teacher, considering rigidity of the uprights in his grading, was perplexed to find them extremely rigid. I might have been thoughtless, but I wasn’t dumb. Realizing my mistake, I had filled the extra space with liberal amounts of sawdust and glue. 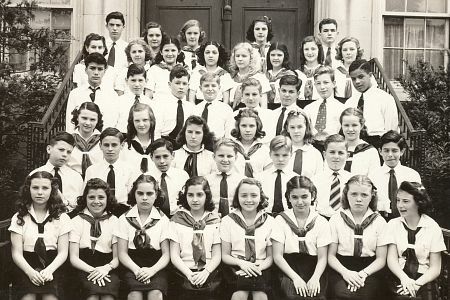 This is a photo of the school’s Glee Club as of June 1939, a collection of enthusiastic singers. I am first on the left in the second row, cocking my head in the usual attempt to deal with a vision problem. By some quirk of our having moved around, the other boys averaged about 1½ years older than I. As the year went on, the other boys moved, one by one, from the soprano section into other sections for lower voices. Mostly into what we called Alto Tenor, but a few, who I thought were obviously oversexed, moved into the Bass section. Then one day we gave a concert for the Parent-Teachers Association, and I was mortified to realize during the performance that I was the only male remaining in the soprano section. An intolerable situation. During the next rehearsal, I lowered my voice in an attempt to pass into the alto-tenor section. The teacher immediately registered a facial expression that is usually associated with bad smells. Passing up and down the aisles and listening closely to each singer, she finally arrived in front of me, and she declared triumphantly, “You’re not making it, Jimmy!” Unable to face the role of soprano again, my only honorable option was to resign from the Glee Club. Thus ended my singing career at the age of twelve. 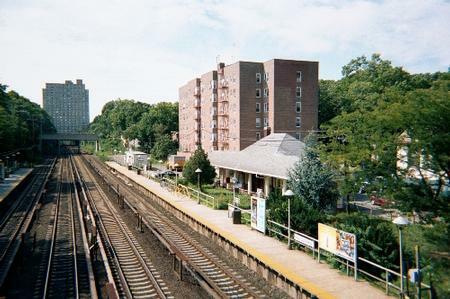 The photo above shows the Long Island Railroad station at Kew Gardens, just across the street from the Mowbray Apartments, probably about 2000. Much frequented by Jimmy, and the scene of numerous escapades. Its main parking lot was a great place for endless bicycle riding. Between the nearby apartment building (then a row of houses) and the tracks was an unpaved secondary parking lot where he had his chief biking disaster (a face full of cinders). In this lot he and friend Lionel Fichman often found a small car unlocked at night, and they “drove” it all around – one pushing and one steering – and then returned it to its original spot. The lot was also by night the scene of early smoking adventures, and by day the scene of wrestling matches to establish the order of dominance among boys at school. The partly visible station platform on the left was open at the far end, allowing access and exploration of its mine-like tunnel interior by juveniles – and tales of unmentionable happenings there in the dark. Just outside this picture to the right, – within a hundred steps of the station – is the setting for the infamous murder of Kitty Genovese in 1964 – observed by many, interrupted by none.